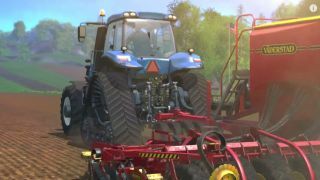 Talk about a landmark moment - the debut trailer for Farming Simulator 15, the first in the series to come to consoles, has just been revealed. It has wheat, it has cows, it has a lot of shots of fields being ploughed. And you'd better know your Ponsses from your Liebherrs because the PS4 and Xbox One versions include some exclusive new vehicles and farming tools. Not to mention that all of of this comes running on a glorious new physics engine. Oh, and we almost forgot to mention - it also has online co-op. Because friends who plough together, stay together.